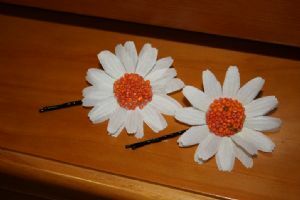 Description: These are handmade hair pins. I can supply them for individual customers or shops and salons. I have a passion for art and crafts. And plan on studying Fine Art next year. I sell my crafts not only to individual customers but to shops and salons too. If you are interested please send me an email at: zoeeire@hotmail.com I can also answer any questions you may have and can send you the catalog by email.